An explanation gave to the visitors in a chemical science laboratory. 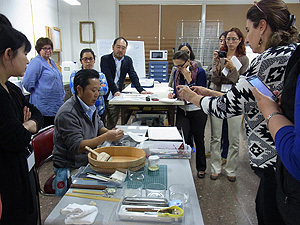 The group visited the Institute on November 18th to examine the Institute’s preservation and restoration facilities to learn about case studies of international collaboration. 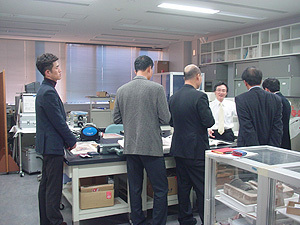 The visitors were shown round a chemical science laboratory at the Center for Conservation Science and Restoration Techniques as well as the Japan Center for International Cooperation in Conservation with the staff explaining the work conducted at these facilities. 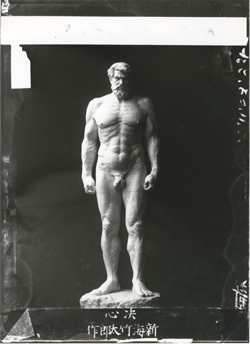 SHINKAI Taketaro (1868–1927) studied sculpture in Europe and he presented works such as Bathing (an important cultural property created in 1907). SHINKAI is known as a sculptor who contributed significantly to the modernization of Japanese sculpture. 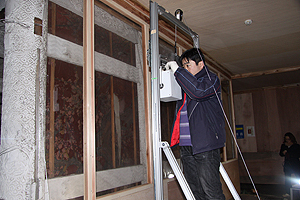 SHINKAI Takashi, grandson of SHINKAI Taketaro, donated a set of photographic plates through TANAKA Shuji (Associate Professor in the Faculty of Education and Welfare Science, Oita University). The plates feature SHINKAI’s works and Nanga (Southern School paintings) by HOSOYA Fuo and his son HOSOYA Beizan whom SHINKAI studied under in his home prefecture of Yamagata. SHINKAI himself was asked to take the photos. The plates also include images of works that are no longer extant, such as Resolve, which won first prize at the Tokyo Industrial Exhibition in 1907. SHINKAI’s photographic works are valuable materials that relate the history of modern Japanese sculpture. SHINKAI Takezo, Taketaro’s nephew, posthumously compiled photos by his uncle, and these photos joined the Institute’s collection prior to World War II (they can be viewed in the Library). 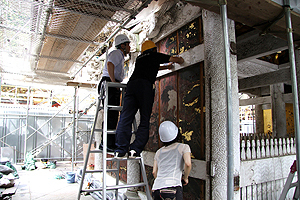 The donated plates were used to produce the photos compiled by SHINKAI Takezo. Plans are to make copies of all of the images featured in the plates and include them in digital archives on the Institute’s website. The 8th Conference on the Study of Intangible Folk Cultural Properties was held on November 15th. The Conference covered “Passing down Techniques: Traditions and Their Use,” and the central theme of the Conference was folk techniques, which the national government began designating in 2005. A system of national designation to preserve folk performing arts and manners and customs has been in operation since 1975. Although preservation of these practices has been amply discussed in the past, there has been limited awareness of the concept of folk techniques and a system to designate them. Moreover, performing arts and festivals essentially fall under practices or events that are out of the ordinary while folk techniques basically fall under routine practices, so a number of people make their living performing these techniques. Thus, these techniques are more susceptible to social and environmental changes. 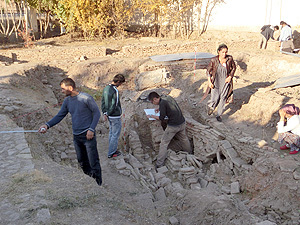 Given this reality, the Conference featured reports and a discussion of current issues encountered in efforts to preserve folk techniques and what types of preservation efforts are feasible. The Conference featured 2 individuals who are working to preserve nationally designated folk techniques and 3 individuals who have worked to preserve craft techniques in Tokyo prior to the system that nationally designated folk techniques. After these individuals delivered presentations, they were joined by 2 commentators to participate in a discussion. 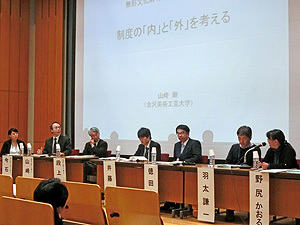 Reports and the discussion highlighted various issues such as the reduced demand for folk techniques (products), the breakdown of specialization, the shortage of raw materials, and the lack of individuals to carry on techniques. There is no magic bullet to resolve the difficulties in carrying on traditions, but the Conference emphasized the fact that concerned parties in different positions need to discuss issues and share information. The Conference also emphasized the need for coordination that bridges the divide between production sites and compartmentalized government administration. The Department of Intangible Cultural Heritage hopes to share and disseminate information by assembling examples of efforts in different areas. 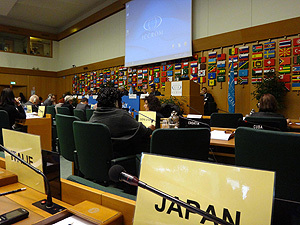 Plans are to publish a report on the conference’s proceedings in March 2014.